A few days back I received an email from the company who arrange most of the product reviews I do, saying that they have a new client Kerrymaid and to get things started they have some hampers to give away for the best recipe with Garlic Butter. Those hampers sound utterly marvellous so I had to get my thinking cap on and quickly! What could be better than making the garlic butter from scratch? I don’t mean incorporating garlic into butter but literally starting with a pot of double cream and progressing from there onwards? So that is what I did. 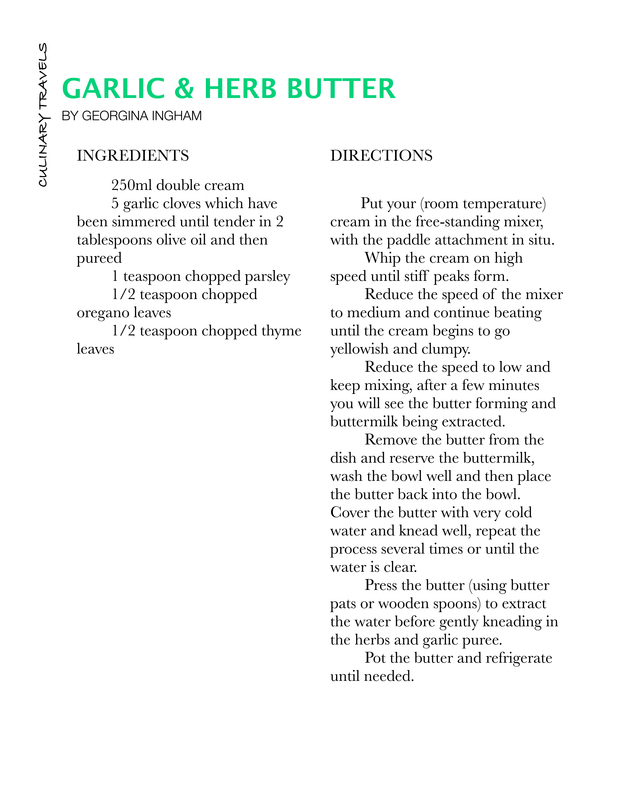 Once the butter had been washed the fun began; I added some finely chopped oregano, lemon thyme and parsley along with some pureed garlic which I had sautéed gently in olive oil to soften but not colour first. This pre-cooking of the garlic leant a sweet flavour to the butter, which lets face it can be rather harsh if raw garlic is used alone. For decorative purposes I put the butter into cupcake cases to set and then peeled them away to present, but you could just as easily pot the butter in a dish or roll it in some greaseproof paper to store in the fridge. To make the most of the butter I decided to use it in a Provençal style dinner – baked ratatouille with garlic sourdough bread! Before I start rattling about the ratatouille, I have to tell you about the sourdough bread, or should I say the foolproof sourdough bread. It’s a long while since I attempted sourdough bread and my lovely starter went off to sourdough heaven but I’ve had a hankering to make some and have been putting it off and off; well when ordering some regular dried yeast I came across dried sourdough starter sachets – I just had to buy some. Following a combination of the Free Bake instructions and a lovely recipe from my bread book of the moment – Bread: River Cottage Handbook No. 3 (River Cottage Handbook 3) by Daniel Stevens I devised a recipe that yielded a deliciously chewy and tangy bread with a delightfully crisp crust. Sourdough breads are wild yeast breads, meaning that they take their yeast requirement from the environment in which they are situated, not by adding commercial yeast. It is likely that sourdough originated in Ancient Egyptian times around 1500 BC, and was likely the first form of leavening available to bakers. Sourdough remained the usual form of leavening down into the European Middle Ages until being replaced by barm from the beer brewing process, and then later purpose-cultured yeast. A sourdough starter is simply a combination of wild yeast and ‘helpful’ bacteria colonies (the same kind found in natural live yogurt and the probiotic drinks that are becoming increasingly popular) – the yeast and bacteria live together in a special sort of cooperative existence, with the yeast eating and breaking down sugars from the flour, and the bacteria feeding off some of the breakdown products from the yeast. The yeast provides the leavening action for the bread, but the bacteria are responsible for much of the flavour. Sourdough starters can live forever providing they are looked after properly, often they are passed from generation to generation. Daniel Leader goes as far as to say you have to think of them as a pet – something to feed, love and nurture. I really must get another starter going soon; maybe even today. Back to my ‘foolproof’ sourdough, stage by stage here’s what I did. The finished result wasn’t as airy and holey as I would have liked (or as indeed most sourdough loaves are) but I think I struggled as much as anything because of the lack of a proving basket, as you can see the dough is rather saggy and the weight of this will have adversely affected the rise of the bread. That however is a problem now rectified as I bought a couple of proving baskets (and some more goodies beside) from The Bertinet Kitchen; a most glorious website but don’t blame me if you buy more than you wanted or end up spending a small fortune. The bread was still highly delicious though, sweet and savoury with a slight nuttiness from the rye flour too. 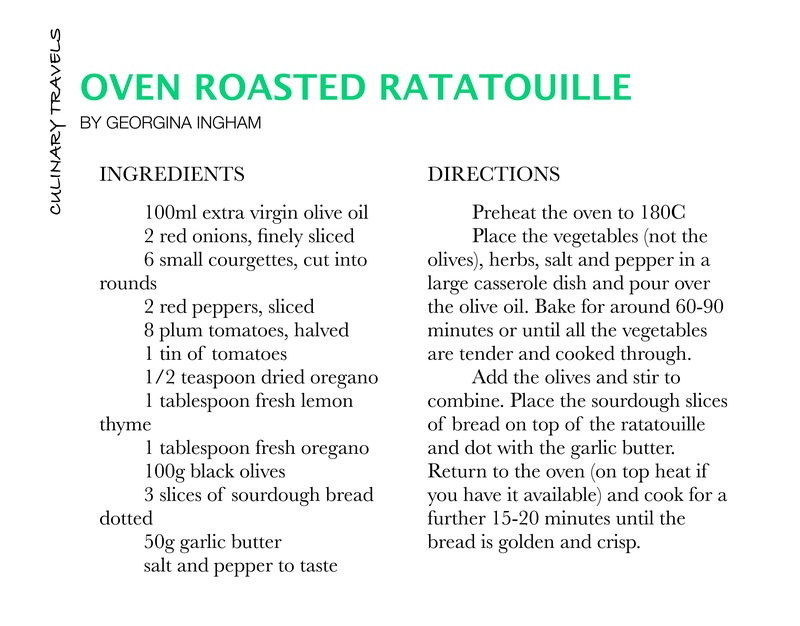 It makes for perfect toast too, which is where the ratatouille idea sprung from – see there is logic here! I will be entering the sourdough to YeastSpotting of course. Ratatouille is derived from the French words ratouiller and tatouiller which according to Alan Davidson (The Oxford Companion To Food) are expressive forms of the verb touiller which means to stir up. Further, Davidson states the first appearance of the word in English was found in Cassell’s Dictionary of Cookery, 1877. Actually at that time the word was misspelled as ‘ratouville’ and referred to a meat stew. In the 20th Century later authors such as Heyraud described the dish as “a ragout of aubergine with tomatoes, courgettes and sweet peppers” eaten throughout Languedoc and Provence. This author also states that the name Ratatouille was given by the citizens of Nice. No matter who is credited with the dish it is very popular throughout France and in many other countries around the world now; it is a cool summer evenings dream dinner for me. The key consideration with ratatouille is to use the very best and freshest ingredients you can lay your hands on; fresh from the garden is best but second to that I’d say go with good organic vegetable delivery or local greengrocers should you be lucky enough to still have one; I don’t much like supermarkets at the best of times and I’m going to be blunt and say this straight – good vegetables and supermarkets do not often go hand in hand. I use Riverford for my organic delivery and I have to say they are utterly fabulous, great array of produce which is of superb quality, excellent friendly service and they don’t airfreight which is a major ethical bonus. Most traditionally ratatouille is cooked on the stove top, often with all the vegetables being cooked separately and then being married together in a rich tomato based sauce before serving. My version however discards with tradition and heads straight for the oven in a one pot casserole delight. The kind of simple oven baked meal that you can forget about while you idle your time away, checking emails, tidying round and the like. By the time you return to the oven in a good hours time the vegetables will be softened, the sauce unctuously flavoured ready for the finishing touches. The finishing touches here are some very good olives and slices of sourdough bread dotted with garlic butter to crisp up while the ratatouille finishes melding together for a true taste sensation. Serve with plenty of extra (plain) sourdough bread to mop up all the lovely juices. Ratatouille is even better the following day, reheated, and that is what I plan to do tonight but this time I’m going to serve it alongside some chargrilled chicken breasts. Our home County Kerry is known as Ireland’s larder and is renowned the world over for the outstanding quality and excellence our fresh produce has to offer. It’s the dedication to great food which makes our garlic butter taste so good. Sounds good to me, I’ll be on the lookout for it – unless of course I’m lucky enough to get a hamper with some included.